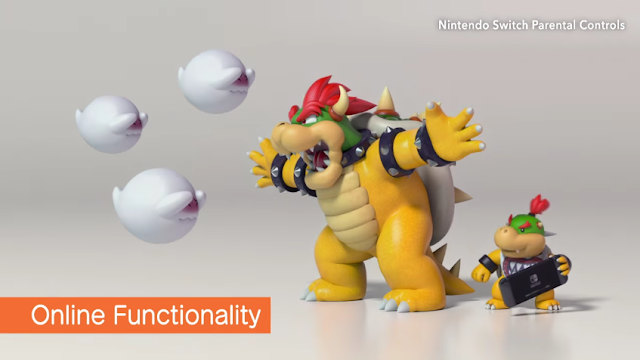 KoopaTV: Bowser puts the Dad in King Dad: Parental Controls! 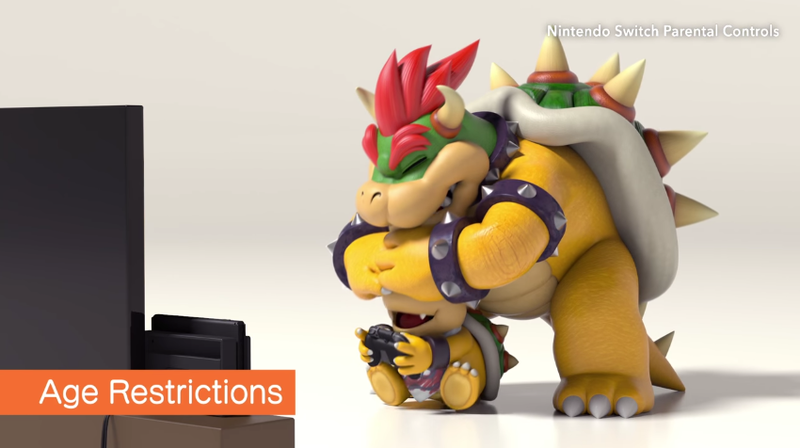 Bowser puts the Dad in King Dad: Parental Controls! By LUDWIG VON KOOPA - King Dad is doing a great job raising his kids. I'd know. In the absolutely important and news-making presentation that Nintendo had on January 12–13 about the Nintendo Switch (that we have covered, LIVE!, here), Nintendo also let slip a cute little video... featuring my dad, King Bowser Koopa! ...And that pest, Bowser Jr., who is technically my brother. But... I don't like to think in those terms. What would be more enjoyable? Me talking about a relatively dull and standard set of parental controls (which I totally approve of, by the way), or me discussing how much of a great father King Dad is? And yet, I do that in so many other articles. ...Don't I? First, let me just state that I did criticise Nintendo for not having parental controls in place on the Nintendo 3DS that could restrict how long a child may play a game. Kudos to Nintendo for handling my criticism and acting upon it. I hope that Nintendo will also allow under-17 children to play M-rated games with these new set of Parental Controls, should the parents approve. KoopaTV waged a sizable campaign to have Nintendo implement that, and Nintendo said they would add our comments to their records. but NOT M-rated games like Phoenix Wright: Ace Attorney — Dual Destinies! I'm annoyed as a whole that Nintendo is making multiple smartphone applications for the Nintendo Switch. The first is this Parental Controls app, and then they're moving socialising on your console to an app, as well. (More on that in a future article.) Look how much King Dad is struggling with that smartphone! He has to touch everything with his claw. That little piece of crap is going to get a cracked screen, I tell you. If a parent doesn't have a smartphone, does that mean they won't be able to set parental controls? On the Wii U and 3DS, you could set parental controls on the very system you're controlling, without the need for external hardware. 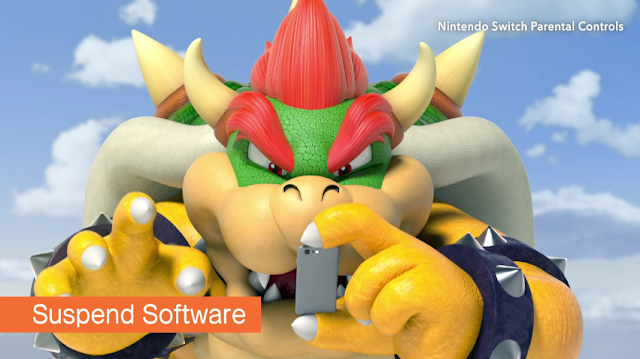 King Bowser is glaring at this annoying little smartphone, which is the size of his finger. Personally, I wish more parents were as proactive as King Dad is in protecting their children online. And when I mean protecting children, I don't mean cleaning up their messes after the kid does something stupid, like give away their personal information over their Internet like their name and school. Some little kid on Miiverse did that to me with their information (totally unsolicited), and I actually tracked down their older brother on Facebook with the information given. I messaged him and told him what his brother did, but I never got a reply. Anyway, what I would prefer happen is preventing kids from going on the Internet to begin with until they know what they're doing. It'd make everyone else's experiences happier. I'm glad I'm old enough that King Dad is FORCING me to interact with strangers (with this website), instead of shielding me from them. The Parental Controls application will also give Activity Log-esque summaries of your child's activity. In the Koopa household, we're going to have multiple Nintendo Switch systems. You can't expect all of us to share just one, can you? I hope this doesn't mean the Activity Log as a whole is gone. I'm still puzzled as to why the Nintendo 3DS's Activity Log is significantly more detailed and superior than the Wii U's. You'd think they'd just be the same. Anyway, I want to be able to gather statistics about my own play without having to be a parent. I'd also would like to know what would be stopping a parent from just looking at the system's Activity Log themselves... unless it doesn't have one. The video promises that, if you know what your kids are playing (because apparently you're just buying games for them but don't know what they are — or even worse, they're buying games without letting you know... perhaps with YOUR money! ), then you can have discussions with them and relate to them better. I don't think Bowser and Bowser Jr. have that kind of barrier between them where they wouldn't be able to talk to one another were it not for the monthly summary reports, but maybe you and your kids do have that, or will have that. ...If that's the case, you probably got a bunch of issues in your family. 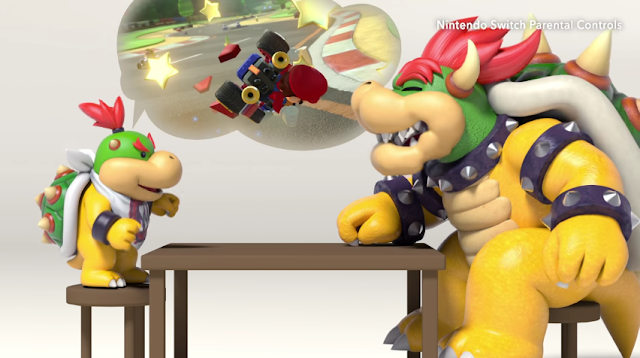 Bowser Jr. and Bowser having a great son-to-father discussion about smashing Mario with a red shell. ...I wish I had those kind of discussions with King Dad, too. One last point: Nintendo really does deserve props for making something as mundane as Parental Controls a trending thing. The video is not only endearing, but also informative. Compare with this For Parents trailer Rare Ltd. made for the Xbox 360 using Viva Piñata. This is not only an annoying trailer, but also devoid of actually useful information. They say that a good parent SHOULD use ”family settings”, but they don't say what these settings can do, where to find them, or how to use them. Both videos are three minutes long, but Nintendo clearly values your three minutes of time much more than Rare did. KoopaTV plans to SWITCH between positive and negative-oriented articles for a bit of time now, with regards to the Nintendo Switch and the new news regarding it. There's fair points on both sides, and KoopaTV will cover them. While Ludwig is still dedicating new posts to his playthrough of Paper Mario: Color Splash (he's pretty much at the end) on Miiverse, you should Follow him there, at NNID PrinceOfKoopas, before it ends entirely. More on that later this week — perhaps even tomorrow! Bowser Jr. having a smartphone is a reoccurring plot element in How Team Koopa Escaped Rio, the accurate account of Team Koopa's harrowing experience in Rio de Janeiro! Shigeru Miyamoto is not Bowser Jr.'s mother — which is why it's only King Bowser in the video, with no Miyamoto in sight. The gold standard is PLAYING games with your kids, and having those games be able to get your kids into a lifelong passion for gaming. Ludwig wrote about Miiverse ending and online subscription fees here. The Nintendo Switch has released, and this Parental Controls app is also live. As you may expect, parents and children form the core of Nintendo Switch family groups. Bowser's parental controls are affecting what games Bowser Jr. can play. I think you have the right to call me insane: I watched the same Parental Controls video more than five times straight! Am I a parent? Only to my siblings (not really). Do I take pride in knowing this information? Uh... depends. Do I simply like the animation quality present in the video? Actually yes! You'd expect in a Parental Controls video to have cruddy animation quality (like the Viva Piñata example), but... I still rewatch it! I'm pretty sure I know how to troll my siblings now. My dad will hate me for ruining their joy and sunshine, though. ...Okay, fine, you're insane. If you want. Troll them, uh, how? By crippling their gameplay by pretending to be a parent and setting really restrictive parental controls? You're a bad little boy. Bowser Jr. - "King Dad, I wanna play Dual Destinies!" Bowser - "Sorry son but that game is intended for mature audiences. Why don't you go play Mario Kart 8 instead?" Bowser Jr. - "That game's not fair! Ludwig always cheats!" Bowser to himself - "That's my boy." It's a really charming video. If Nintendo can nail some really good marketing videos like this for the Switch's features around launch, and maybe even a bit after, to promote the system, I think it would be a good feather in their cap towards getting people interested in the system. What if Link from Breath of the Wild showed you around some of the system's OS, or something like that? I think it's be pretty neat, so here's hoping Ninty doesn't stop here with the animated infomercials. ...I could totally see Link being all weird and silent and awkward! Maybe if Zelda joined him. KoopaTV is now on the GAB Social Network! Get ARMS to EVO 2017!